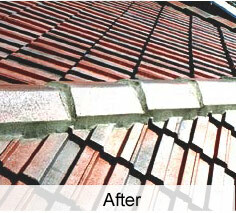 Bedfords Roof Restoration have the skills to be able to both troubleshoot common problems inherent to Perth tile roofs and then provide the correct solutions for these problems. 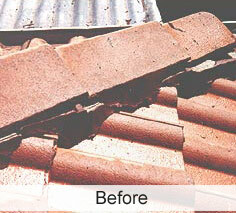 Many people pay little attention to this aspect of roof repairs and maintenance. Cement under ridge caps can become loose and deteriorate over the years and lead to the possibility of leaks or ridge caps actually being blown off in high wind situations. Depending on the condition of your ridge caps we will either repoint or rebed your ridge caps. Re-pointing: Repointing consists of leaving the ridge caps on their original bed of cement and applying a fresh coat of appropriately coloured cement to the outer surface of the old pointing. This will commonly be done in situations where the original ridge cap cement is not too badly deteriorated but significant cracking has appeared in the surface of the pointing cement. Re-bedding: Re-bedding is needed if the ridge caps have been dislodged or if the cement bed has significantly deteriorated. All ridge caps are removed and are then re-layed on a fresh bed of cement.